UbuntuDeal, which was launched in late 2010, provides daily offers of 50% to 90% discount on restaurants, spa, massages, entertainment, travel, and much more! After establishing itself as a leading Daily Deals website, UbuntuDeal was acquired by bidorbuy.co.za in April 2011. 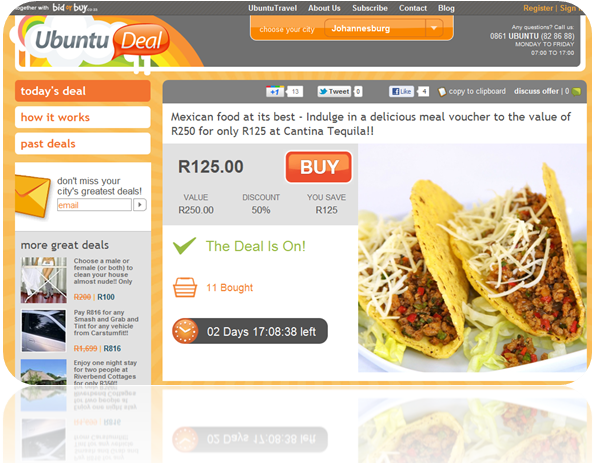 UbuntuDeal has recently upgraded its looks and currently provides deals in all the major cities in South Africa. In addition to having deals in specific cities, UbuntuDeal also has a very active Travel section that contains a few new deals every week. Tough updated less frequently, the site also has a Wine, Products and National Deals categories. In addition to having great deals, UbuntuDeal are well know for their friendly service and efficient support. If you are not interested in receiving a daily email, you can follow UbuntuDeal on Facebook, Twitter and YouTube channel. 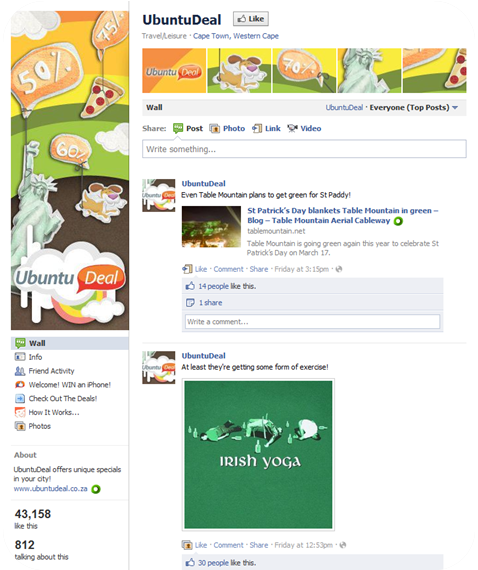 With over 40,000 Facebook followers, UbuntuDeal has the most active Facebook page in the daily deals arena.